A Correct Chart of St. Georges Channel and the Irish Sea, Including all the Coast of Ireland, and ye West Coast of Great Britain from Cantire to Portland Isle: From the latest & best Observations. 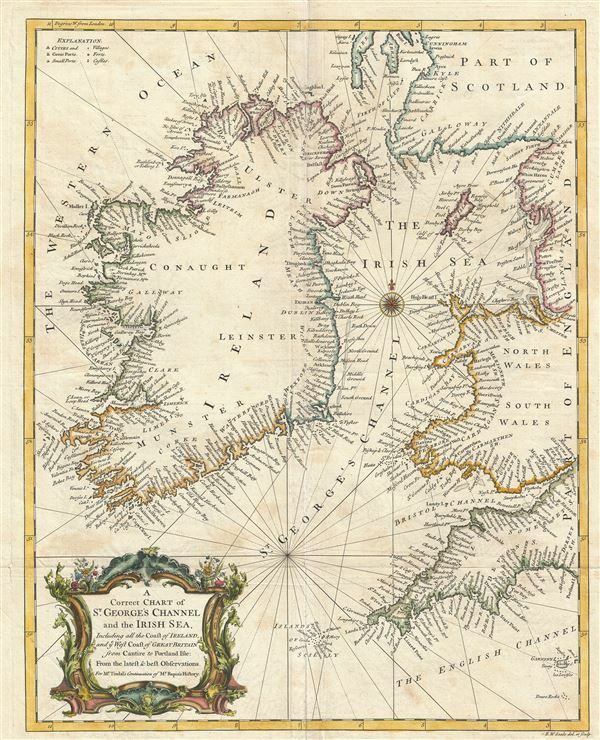 An extreme attractive 1747 nautical chart or maritime map of Ireland and St. Georges Channel. Engraved by R. W. Seale, this map covers the entirety of Ireland as well as adjacent parts of Scotland, England, and Wales. Being essentially a nautical chart, only coastal cities and towns are noted and rhumb lines are present throughout. Shoals and other underwater dangers are identified here and there. An elaborate cartouche of a rococo ethic is set in the lower left quadrant. Seale engraved this chart for includes in M. Tindal's English language translation of M. Rapin de Thoyras's History of England. Rapin de Thoyras, M., The History of England, trans by N. Tindal, (London) 1747. Very good. Some toning and wear on original fold lines.